Alrighty, so here's the lowdown on cloth and our girl, after almost 8 months. If you recall, we had originally planned on doing Bum Genius Freetime and Grovia Hybrid. The Grovia Hybrid does not work for us at all. You snap the insert in, so you can either use the same cover with a new insert, or wash the whole thing. This means I was touching the soiled part of the diaper, blech, and the insert just fits funky in the cover. I'm sure these are great for other people, but we are not fans of these. Initially, we felt the Freetime was overly bulky, but as E has grown, it seems much less so, and if I didn't own two (yes, two) full stashes of other diapers, I would invest in more of these. Maybe if we have a second bambino. Why in the world do I have two full stashes of diapers? Because we really liked the trimness of Fuzzibunz when E was smaller, and bought a stash, but we had a lot of leaks with them, and after exploring all kinds of possibilities as to why, I determined they were just not a great fit for my chunky thighed baby. Still holding onto them for backups, and because her legs may thin out when she starts moving, or our next kiddo might have chicken legs like their mama. Our go to diapers these days? Bum Genius 4.0. They're a One Size Pocket Diaper, and we have 18 of them. We do use our one Freetime, so I guess our total stash is 19, and I do diaper laundry about every 2-3 days. E is on solids now, and we've installed the Bum Genius Diaper Sprayer, but I rarely have to use it, as most of her solid waste just rolls off the diaper (hope that's not something to be worried about). At night, I triple stuff her diapers with a regular insert, a Thirsties hemp insert, and the newborn insert. E has had one bad diaper rash since we started using cloth- it was over Thanksgiving, and it was a yeast rash. We had to use disposables and a prescription cream for about 3 days to clear it up. I also washed her cloth diapers twice using Grapefruit Seed Extract (which kills yeast), and also washed all her bath towels etc, using the same GSE. She does still occasionally get slightly red and splotchy down there (almost a pre- rash), but it's nothing some extra air time won't cure. I do try to give her air time between each diaper change, and sometimes there's no rhyme or reason as to why she'll be red during one diaper change and fine the next. Girlfriend just has sensitive skin. I've tried both the Grovia Magic Stick and Grandma El's Diaper Rash Creams and really haven't seen that they help our girl that much. 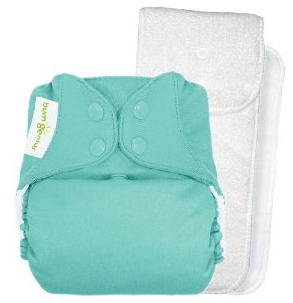 For disposables, we tried the expensive organic Seventh Generation disposables when we went to Maine, and we either had the wrong size, or they are just not good diapers as we had a leak or blowout with pretty much every other diaper. When she had her yeast rash, and when we traveled over Christmas we went with the cheapo Walmart Parent's Choice brand and had no issues with leaks or sensitivity, so it's nice to have found a disposable option. What's funny about this is I literally went in and just picked the cheapest diapers I could find since I figured she'd get a rash from them regardless, and I just wanted to clear out the yeast, and we happened onto a brand that doesn't seem bother her tush! However, she's only in disposables for a few days at a time, so that may have something to do with it. I do diaper laundry about every 2-3 days. Cold rinse, then add detergent (we use Rockin' Green) and wash on hot with a cold rinse, and an extra rinse. Dry on delicate for 60 minutes. Stuffing only takes about 10-15 minutes, but I've been guilty of just throwing all the clean dipes into a laundry basket and stuffing them as I need them (gives E some extra air time haha). We have a Planet Wise diaper liner and use a plain tall trashcan we got at Walmart that has a lid for her dirty diapers. We also have the medium Planet Wise wetbag that stays in our diaper bag when we're out and about. At home we use cloth wipes and a homemade solution of water, bodywash, and baby oil in a spraybottle. We used to wet wipes down each time we left the house and keep them in a container in the diaper bag, but now I just leave a pack of disposable wipes in there because we're only talking about needing 1-2 wipes each time we're out and that little use of the disposable wipes doesn't bother her. I think that pretty much covers anything you could possibly have wanted to know about our routine, but if anyone has any questions I'd be more than happy to answer them! I have no experience with this, but I did enjoy learning--thanks for posting! LOVE those squishy baby thighs!